Singapore Marriott Tang Plaza underwent a $35 million refurbishment in 2012, and they are in the midst of refreshing the look of their corridors. The hotel boasts 393 rooms across 10 categories. As part of the new Staycation Package, we stayed in the Deluxe Room. I was blown away when I first stepped in because I wasn't expecting the room to be this big! 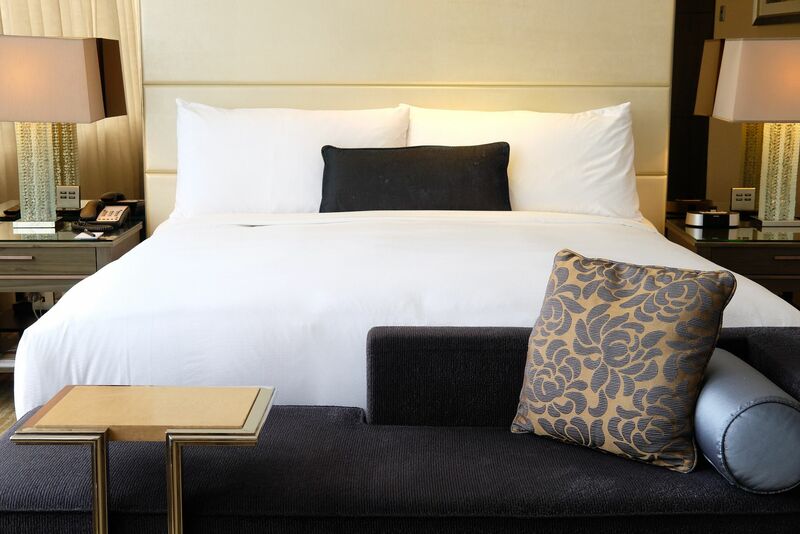 The 32 to 34 square metre room sports a sleek and contemporary look, completed with the most incredible bed prepped with signature Marriot Revive® bedding. Don't be surprised if you find yourself not being able to leave the bed! 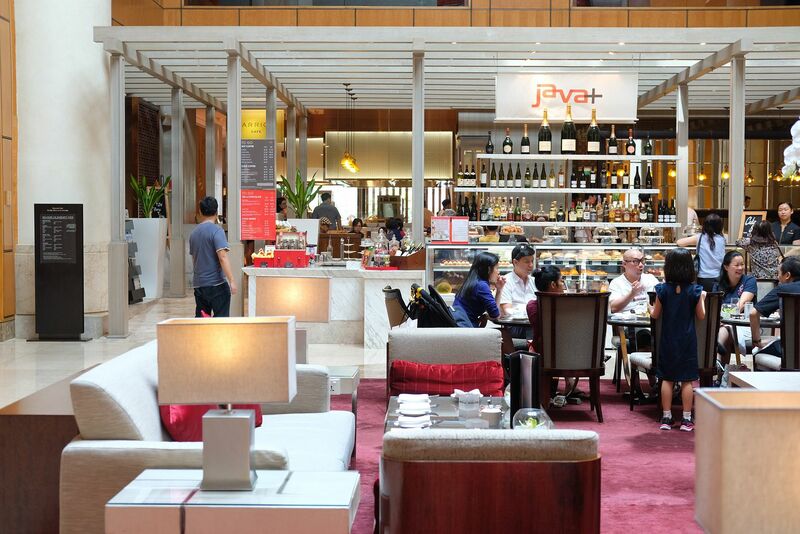 Book Singapore Marriott Tang Plaza here. A 46-inch Full-HD Smart television, and a pretty marble table with 1956 leather Eames Desk Chairs await. The bathroom which has a walk-in rain shower is really spacious too. There's even a vanity area! The room also has a large walk-in wardrobe, where you can find an iron, ironing board and in-room safe. 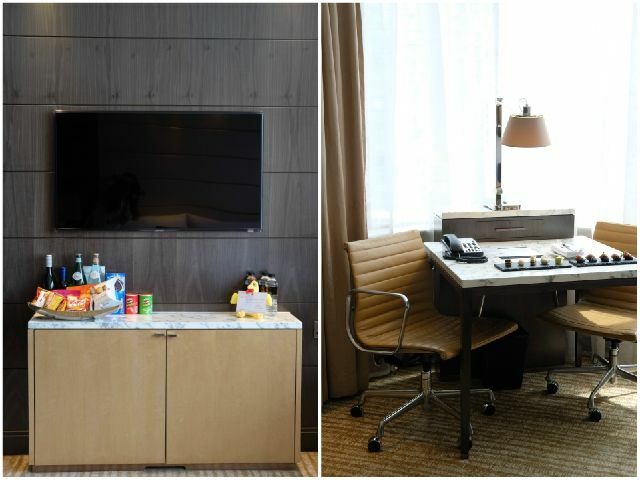 Marriott takes pride in the clever maximization of space with their built-in cabinet where you can find cups, utensils, tea bags and the likes, and a small fridge that houses wines, champagne and other beverages. 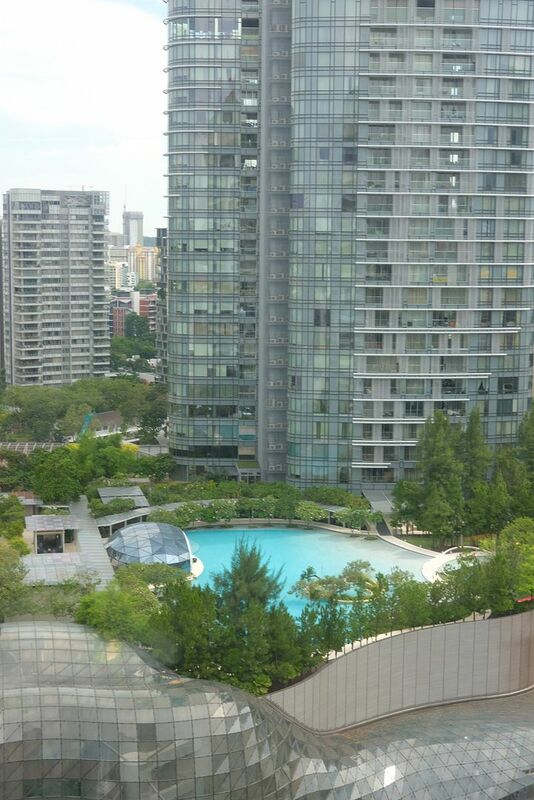 View from our room on the 23rd storey! The inviting pool is flanked by cabanas and deckchairs. Imagine having a leisurely swim and sipping an ice cold cocktail as you kick back and relax in one of the cabanas. How much better can an afternoon get? There's also a fitness centre and a basketball court. There are 9 Pool Terrace Rooms and a Pool Terrace Executive Suite on the same level, literally just steps away from the resort-style pool. 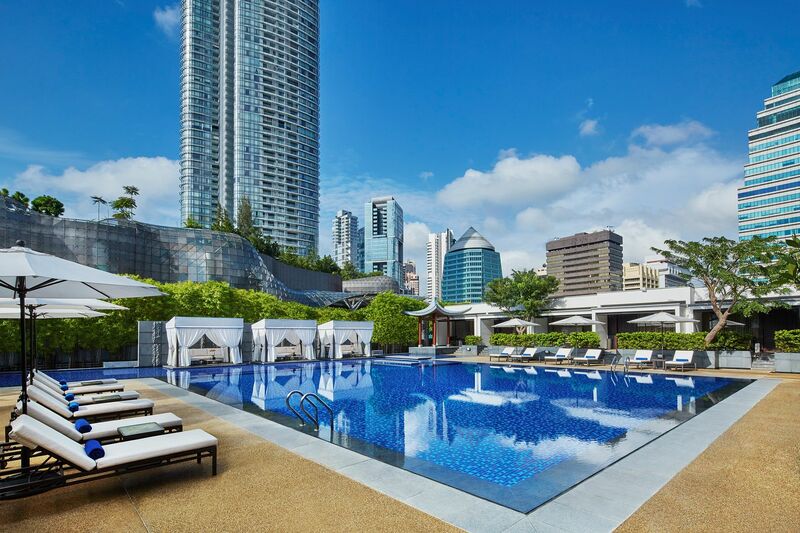 The Pool Terrace Room (42sqm) has both Asian architectural influences and contemporary design elements. The 10 rooms are always fully booked and it's not surprising because the rooms are really pretty. 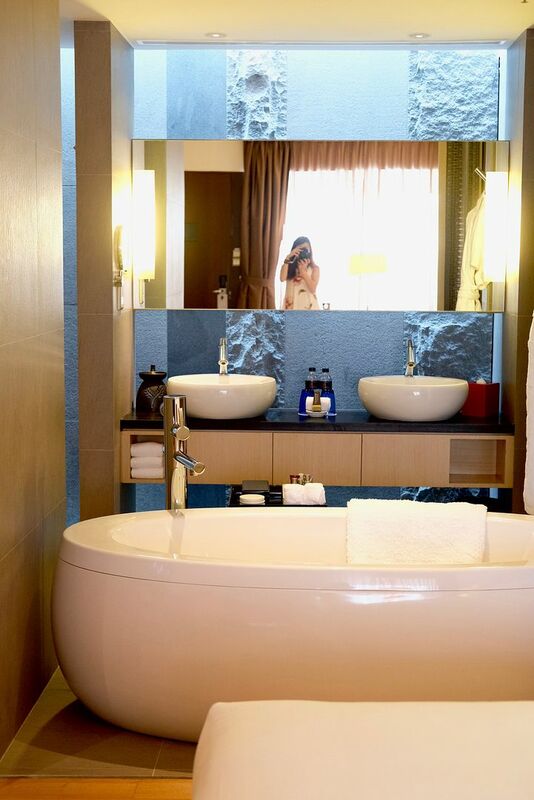 Will you just look at that tub! This is the perfect room for couples! There are also tables and chairs on the balcony outside the room, if you prefer to sit there and soak up the afternoon sun, or catch the night breeze. The Junior Suite(54 sqm) is especially popular with bridal entourages. It's also a more-than-ideal space for bachelorette parties. The roomy bathroom has two sinks and a nice bathtub. When I was walking to the lobby, I noticed a really long queue that stretched all the way out of the glass doors. It was later, that I realised that they were queuing for the afternoon tea. The revamped Executive Lounge(open from 6am - 12am) is of course, packed with guests throughout the day. Guests staying on the Executive floors enjoy access to the lounge, complimentary modified continental breakfast (6am - 10am/11am), cocktails(530pm - 930pm), hors d'oeuvres(530pm - 730pm) and desserts (730pm - 930pm). 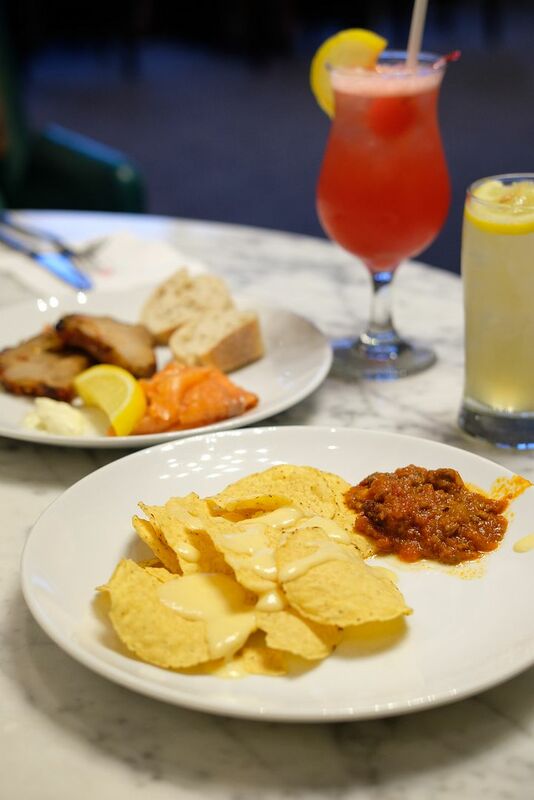 We popped by around 630pm and got ourselves nachos with chilli con carne and cheese, bread, pork with Thai chilli sauce, and smoked salmon. Guests can look forward to aglio olio, roasted vegetable, carrot soup and sushi as well. Note that the dishes are subjected to change. We also had a Singapore Sling and Cucumber Cooler. If cocktails aren't your thing, beer, wine, mocktails, housepours, and soft drinks are available too. 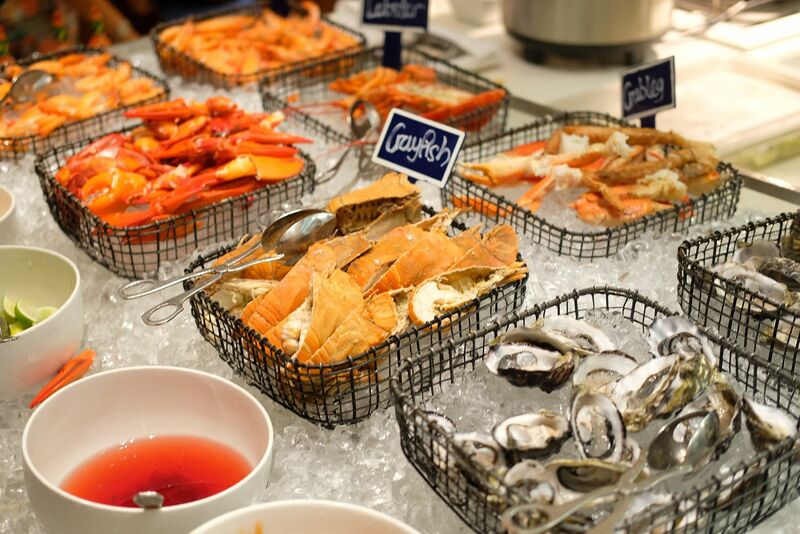 Indulge in a lavish dinner at Marriott Cafe, where you can treat yourselves to a buffet line-up of fresh seafood, Asian delights, fresh salad, International treats, meats, pasta and an array of desserts. 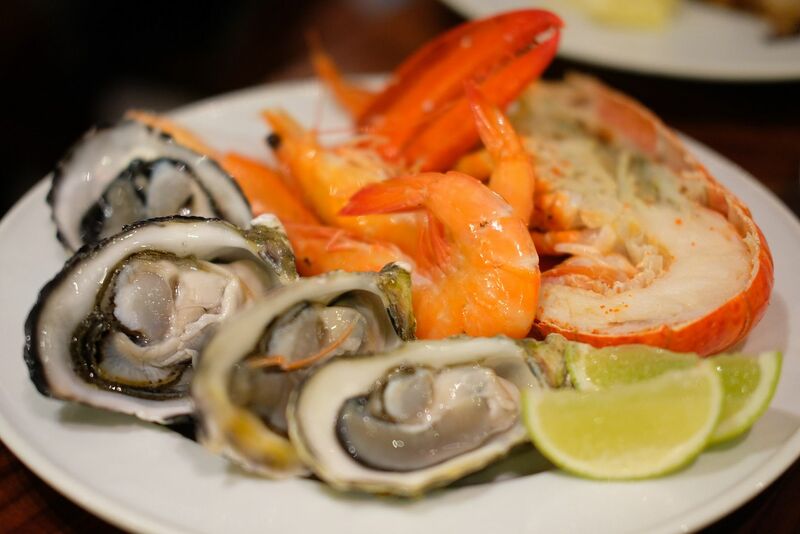 Eat as many oysters and lobsters as you want! 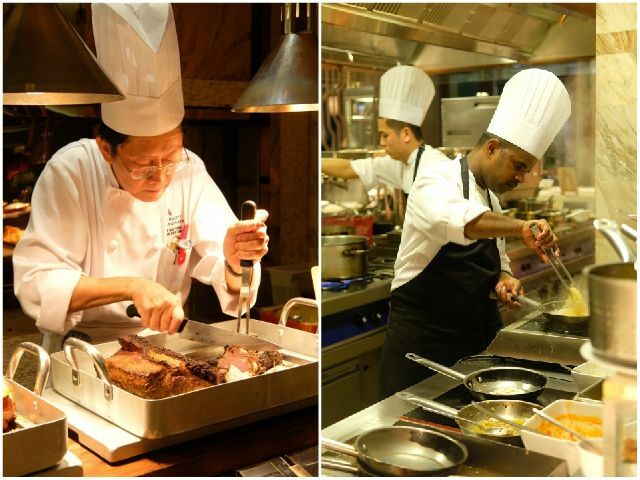 Don't miss the Slow Roasted Prime Rib, Crispy Pork Saddle, and live pasta station where you can get a really scrumptious plate of carbonara. Round off your meal with desserts which include icecream, cakes, fondue, bread and butter pudding and their signature Sticky Date Pudding. After dinner, we headed to the executive lounge again, before heading back for some tv and a good night's sleep. Oh, I still dream about the bed sometimes..
We woke up at 10am and headed to the executive lounge, once again, for breakfast. 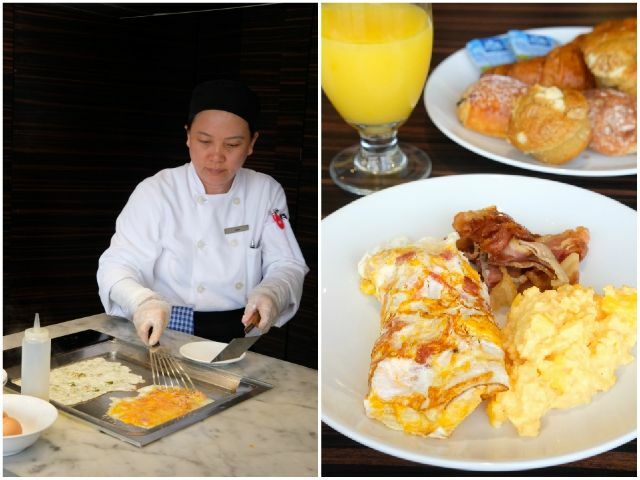 You can have breakfast at Marriott Cafe too. The spread at the lounge isn't super wide but you get your omelette, fluffy scrambled eggs, bacon, dim sum, sausages, bread, pastries and more. The selection isn't fancy but it was tasty and satisfying. Usually, we will have to prepare for check-out after breakfast. However, we didn't have to this time round! 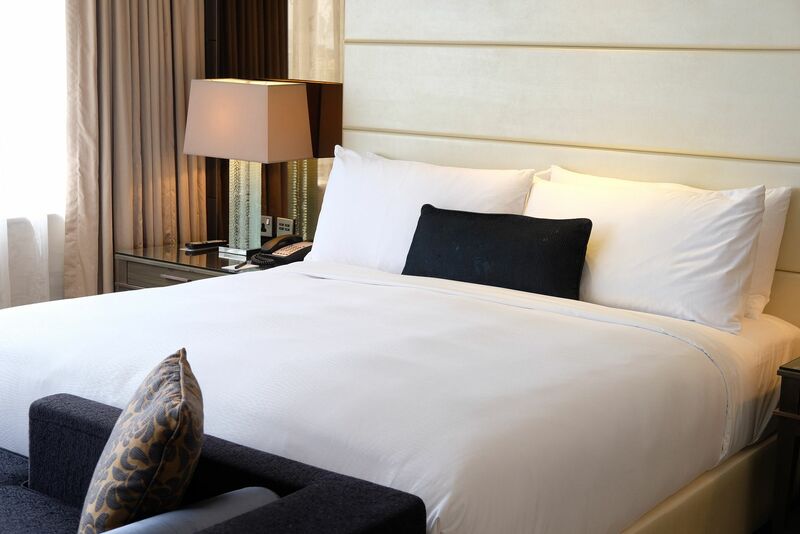 The Weekend Staycation Package includes late check out yay! Being sloths, we went back to the room to catch another long nap before we finally left the room, and hotel, at 3pm. 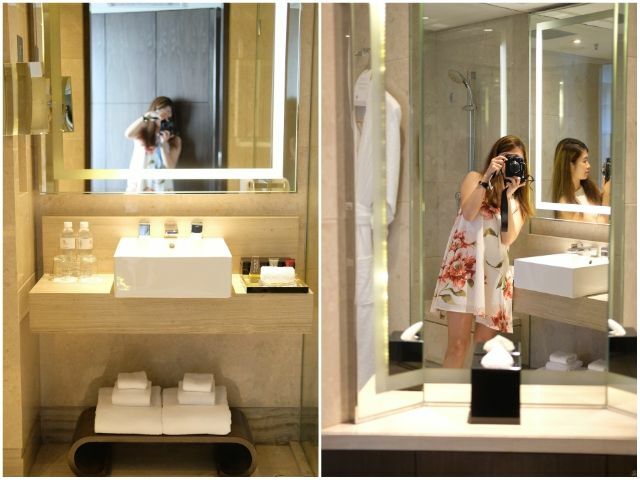 We really had such a wonderful stay here! Service was top notch all the way, and there's really nothing to complain about. I can't believe that the staycation package is this affordable too. Really super value for money, and worth every penny! The package runs till 31st December and is exclusive to Singapore Residents only.